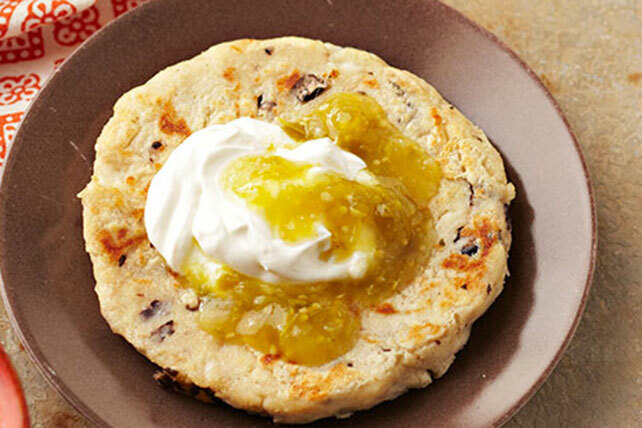 Topped with sour cream and green salsa, this Cheesy Black Bean Gorditas dish is a Healthy Living recipe with delicious south-of-the-border flavor. Mix masa, water and beans with hands until mixture forms dough; roll into 12 balls, each about 2 inches in diameter. Cover with damp towel until ready to use. Flatten each ball into 5-inch round. Spoon 2 Tbsp. cheese onto center of each round; gather dough at top to completely enclose filling, pressing edges together to seal. Flatten to 4-inch gorditas (patties). Heat large skillet or comal sprayed with cooking spray on medium-high heat. Add gorditas; cook 2 to 3 min. on each side or until slightly puffed. Serve topped with sour cream and salsa. If using a tortilla press to flatten the masa dough, cover the bottom of the opened press with a piece of plastic wrap before placing a dough ball on center of press; cover with second piece of plastic wrap. Lower top of press, then lock handle. Open press; remove tortilla. Discard both sheets of plastic wrap. Repeat with remaining dough. If tortilla press is not available, flatten dough balls between a flat surface and an 8-inch skillet, using a sheet of plastic wrap to protect the dough from bottom of pan. Substitute 1-1/2 lb. fresh corn masa dough for the masa harina and water.